Before I got into researching about the Maker Movement I took part in a MOOC which was run by Adelaide University. It was about unpacking the Digital Technologies Curriculum. It was a really inspirational MOOC and I gained so much from all the other participants and was also thrilled to learn that I was already doing many of the concepts mentioned in the MOOC and by others! The MOOC has now run a few times and I highly recommend it. Our younger girls enjoy programming Bee Bots to locate places on a treasure map or spell their names on a letter chart. We often set up circuits to navigate! 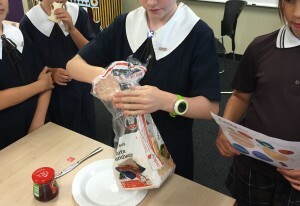 The girls have also been robots and followed instructions for making jam sandwiches and stacking plastic cups. After following verbal instructions the girls then challenge themselves to write code! These ‘unplugged’ games of patterning and cracking codes led onto having fun creating interactive games using ‘Hopscotch’, A.L.E.X , ‘ScratchJr’ and ‘Scratch’. 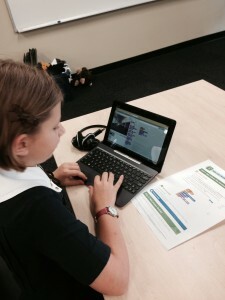 The older girls explored projects in Scratch https://scratch.mit.edu/ and have now started creating their own interactive games and animations. It was wonderful last year to see one year 6 student use Scratch to demonstrate the flow of electricity in the school’s Science expo! Learning to code is about learning a language to string together instructions for a computing device to work. 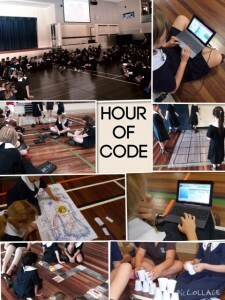 Our club is not about learning complicated ‘code programs’ but learning many of the associated skills to programming like computational thinking which teaches how to tackle large problems by breaking them down into a sequence of smaller, more manageable problems (Dr Dan Crow). Computational thinking is a skill which helps us to understand and master technology of all sorts and solve problems in everyday life. Our girls collaborate, share and have fun tinkering with different software to be creative whilst learning valuable life skills. Some sites worth looking at…. One person I listen to is Nicholas Negroponte, founder of M.I.T Media Lab and of the One Laptop per Child non-profit association.